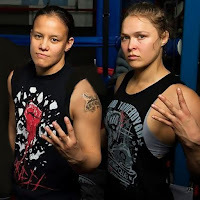 In the below video, Shayna Baszler spoke about her friend Ronda Rousey joining the WWE and Rousey's Royal Rumble debut. "I was just as surprised as everyone else, she kept that from all of us," Baszler said. "Because, in her own words, she wanted us to feel the genuine excitement that the rest of the world felt. We worked hard to get where we're at - all of us - so to see her genuinely happy and finally getting to soak in that reward is great. I've known Ronda for awhile and everything she decides to do she dives head-first one-hundred percent into. So, I have no doubt she'll be just as dominant in WWE as she's been at everything else."